July is here and it is going to be a great month for Old School. The tournament arena will be here in mid-July, shortly followed by the tournament itself! 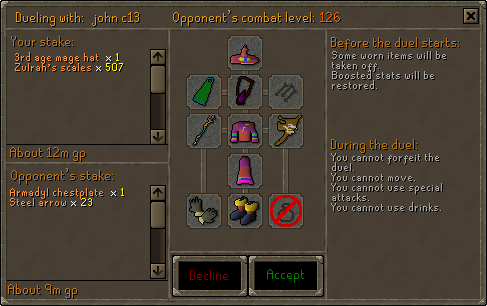 We've also got a large rework of the duel arena that will help ease the process of fighting others while also drastically reducing the possibility of scams. Mod Maz has been hard at work revamping the duel arena to make it a much more robust piece of content. 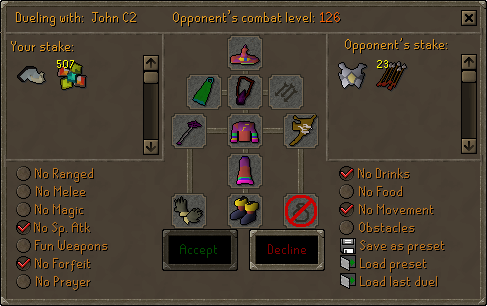 In addition to the duel arena being refined as a whole, there are some new features to make dueling at the arena a lot more pleasant of an experience. It is now possible to save and load a chosen set of rules for duels. When on the challenge screen, pick the rules you would like to create a preset for and click the 'Save as preset' option. You will now be able to load these rules at the click of a button using the 'Load preset' option. Scamming has, unfortunately, been a problem at the duel arena for as long as the duel arena has existed. 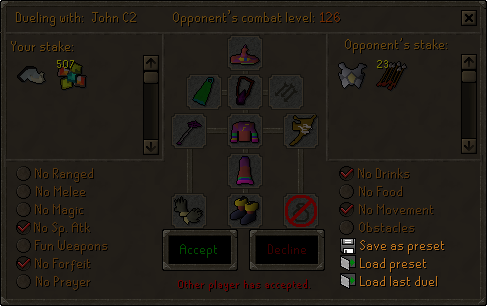 With the duel arena revamp we have added a number of anti-scamming measures. The second screen that appears when starting a duel has been given a makeover. It will now provide much more information about what the duel you are potentially entering will entail. You can see exactly what rules are set including specifics about which equipment slots are enabled. We are really excited about the first ever Runescape Competitive Tournament and we want to give every player the chance to see what it is all about. In mid-July we will be opening the tournament servers to every player! That means that you and 4 of your friends can log onto one of the dedicated tournament servers and fight another team of players in the special tournament arena. Your accounts will be buffed so they are maxed level and you will be able to choose the best equipment to fight with! Once you have finished on the tournament servers you can log back into the normal game servers and carry on leveling from where you were before. What happens on the tournament servers, stays on the tournament servers! The tournament servers will only be open for 3 weeks so you only have a limited chance to take advantage of this unique opportunity. Get your teams ready and find out how good you really are! On the 24th of July we will be hosting the first ever RuneScape Competitive Tournament. You and four friends can fight in unique PvP arenas, using the best accounts and best equipment in Old School to win a share of $10,000! If you think you are among the best PKers out there, you now have the chance to prove it! We'll be giving $5,000 to the first place team, $3,000 to the second place team and $2,000 to the 3rd place team. This tournament will be 100% online, avoiding the hassle of bringing everyone to one location and allowing players to compete in the tournament from the comfort of their own home. Of course, the entire event will be live streamed on Twitch. This tournament will allow us to dip our toes in the competitive gaming scene and help us gauge whether there's potential to host a larger scale tournament at a venue like RuneFest. If you're interested in applying to be a part of the tournament you can head over to the application page to enter. Applications close on July 3rd so make sure to get yours in while you can! Nothing on the slayer bosses this month? What's with the Sega Megadrive based icons for the Duel Arena update? where is the ******* slayer bosses updates? I see nothing big for July.